This pretty layered dessert offers a tart lemony flavor complimented with the sweetness of the angel food cake and whipped topping. If you like the fresh flavor of lemon, see How to Make Homemade Lemonade. Prepare the angle food cake mix as instructed on the package. Allow it to cool completely. Combine the sugar, cornstarch, water, and salt in a saucepan and stir until the cornstarch is dissolved. Cook these ingredients over medium heat until the mixture is clear and has come thickened. Cook it until it just comes to a boil. Remove from the heat and add the butter; stir until melted. Pour in the lemon juice and stir until completely mixed. Allow it to cool and then refrigerate the mixture so that it thickens a little more. It should be about the consistency of pudding. 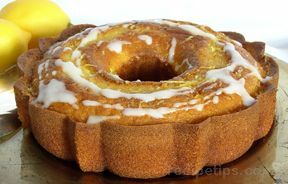 Remove the lemon mixture from the refrigerator and begin to layer all the ingredients. 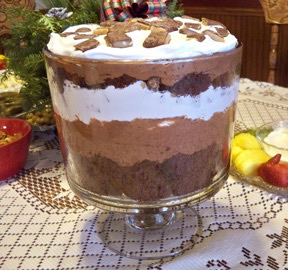 Begin by putting a layer of torn pieces of cake on the bottom of a trifle bowl. Use a little less than half the cake. 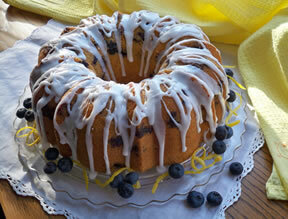 Spread half the lemon mixture over the cake and then sprinkle this with coconut. Add half of the whipped topping and spread out evenly. Repeat the layers of cake and lemon mixture. You will probably end up with a little of the cake leftover. Next add the rest of the whipped topping and spread out so that it covers the entire top except for about an inch around the outer edge. 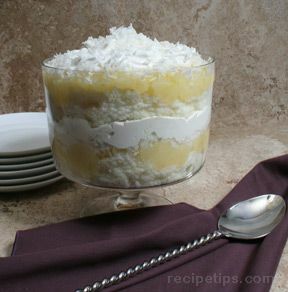 Sprinkle coconut over the entire top of the trifle. Serve the trifle immediately or it can be refrigerate for a few hours before serving.